We got back to Tashkent and Streak and Storm were still there at the hotel which was good. It was funny to see the number of finger prints all over as various kids, and adults, would have climbed onto them to take photos!! We spotted them doing so from our hotel window on a few occasions!! The Turkmen visa process was the same as when we dropped off our application: up at 5am to get there before 6am and get our name on the list. Return to the hotel (30′ walk each way) for breakfast and return to the embassy to wait for our name to be called at 9am and then wait our turn. We were 4 & 5 on the list. Our application has been approved so we left our passports and were to return at 4pm to collect them again. Time for more washing, then some food shopping, buying water, getting more bagsfull of local currency and repacking. Later that day, we get our passports back with Turkmenistan visas. We are good to go. It seems strange as, for the first time since we left in June, we have not ridden our bikes in over a week!! We get up at 5am for an early departure as it takes us 2.5 hours to get ready – up, shower, breakfast, final packing, taking all our bags to the bikes – we have 4 panniers, 1 roll bag with sleeping bags and mats, 1 roll bag with tent, several shopping bags with all our water and food and now 2 extra 10 litre fuel containers, jackets, helmets, waterpacks (rehydration backpacks) and topbox bags with maps, essential documents. We look like gypsies as we leave our hotel room with all those bits and pieces but everything has its place on each bike. We leave Tashkent in the lovely coolness of the early morning. We are excited to be moving on again and riding our faithful Streak and Storm. Our ride back to Samarkand is uneventful and thanks to Anthony’s good sense of direction, arrive very close to our friends’ home, having taken numerous little windy, dirt track back roads. We stop at a crossroad that we know is very close. But we don’t have a street name or house number. As soon as we stop, as always, we are surrounded by a group. We ask if anyone speaks English. One guy is called from a home. I ask him if he can speak to my friend Aziza who could then give him the final instructions on how to get to her parents’ home. Having an Uzbek sim card has been very handy. We were exactly 5 houses away, and was in fact Aziza’s brother’s friend!!! What a memorable evening!! Our friends treated us to yet another feast. 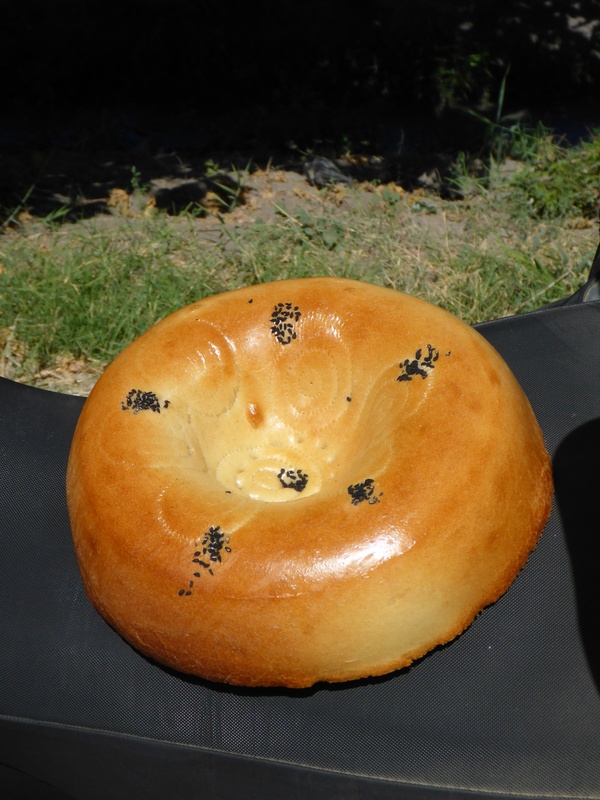 We had delicious plov, traditional Uzbek pilaf, the most delicious home made sausage rolls, amazing bread, fresh juice from home grown grown fruit, home made wine that tasted more like port. How we wished we could converse with Jamkur more. It was interesting to understand the reason for his allegiance to Russia still. We talked, laughed, I cried then others cried. Anthony was given a very special Uzbek cap, with the traditional ‘evil eye’ protection, which isn’t circular, but in the almond shape of their eyes. We were asked whether we wanted to go to another wedding, but we declined. 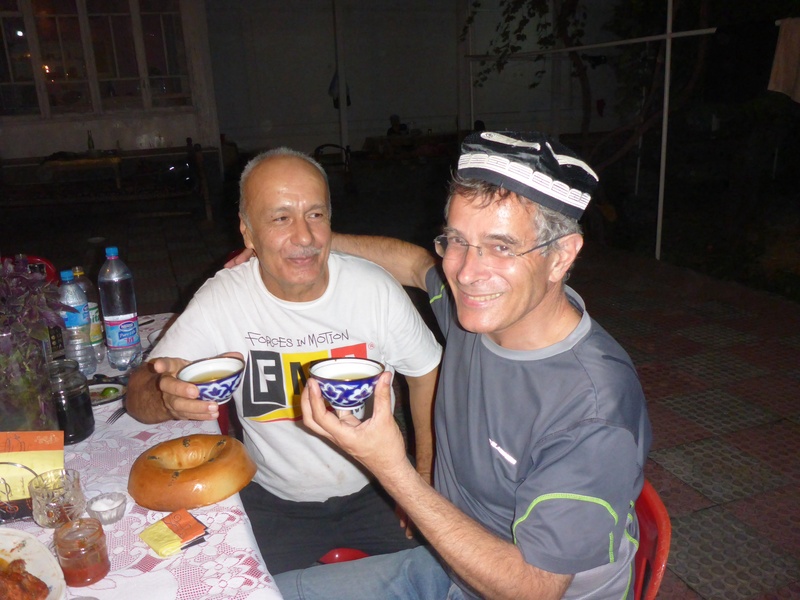 We were then taken to Gulnozaz’s home for the night, where we were treated to more food and a wonderful welcome. 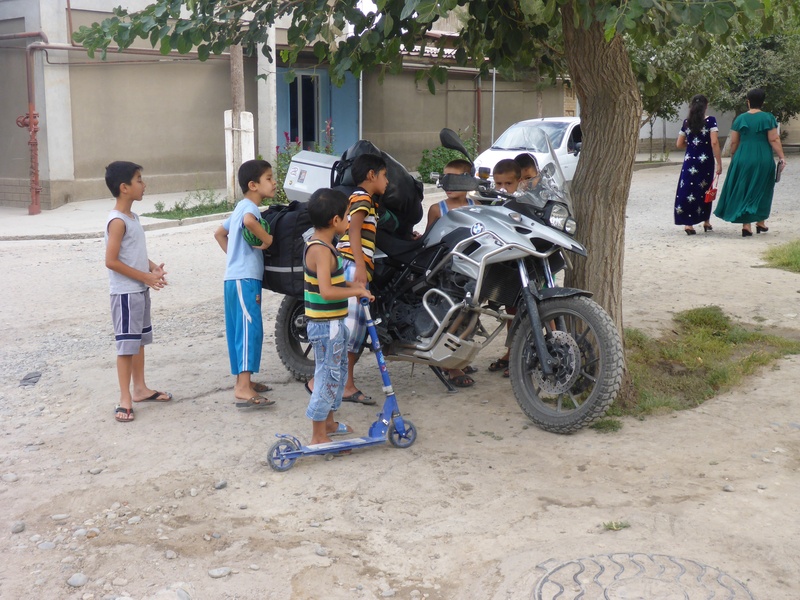 The next morning, we went back to Aziza’s home, had a huge breakfast and repacked the bikes. 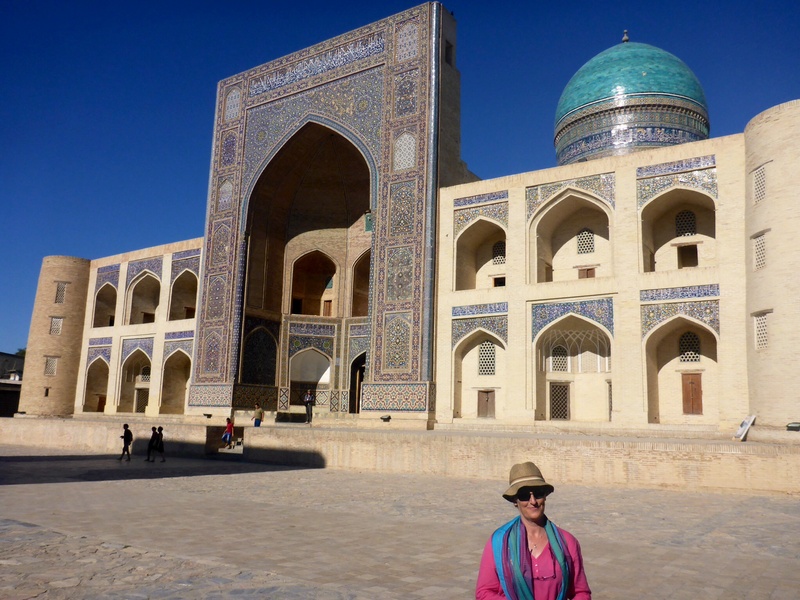 We set off, more tears and a huge lump in my throat… Samarkand was visually breathtaking, but we left a little part of our hearts behind. We’ll be back one day. We arrived in Bukhara as planned, around 5pm and found the little hotel I had tried to book for 3 nights but hadn’t heard back from. They had a room for the 1st and 3rd nights only and would find us a place for the 2nd night. We were too hot and tired to hunt for another place so we accepted. We got a gorgeous room. 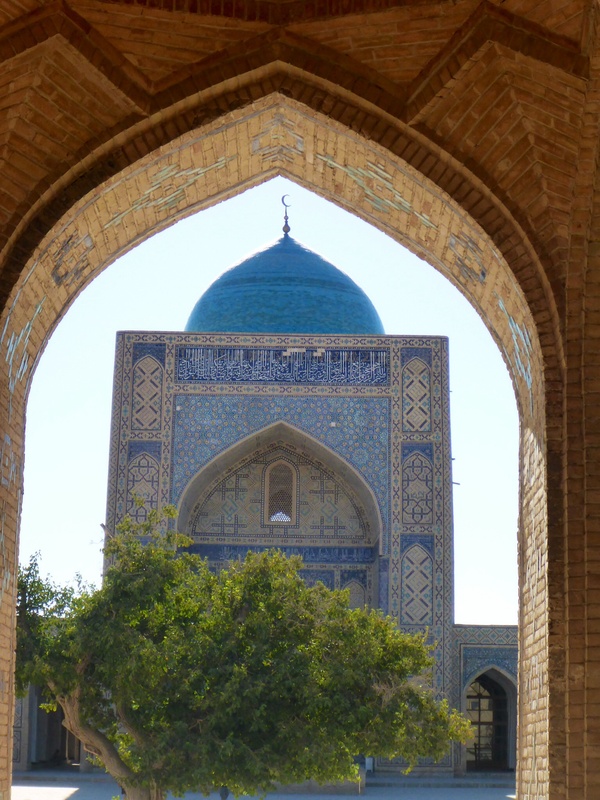 While Samarkand was breathtakingly stunning, I was in awe of the architecture of Bukhara. 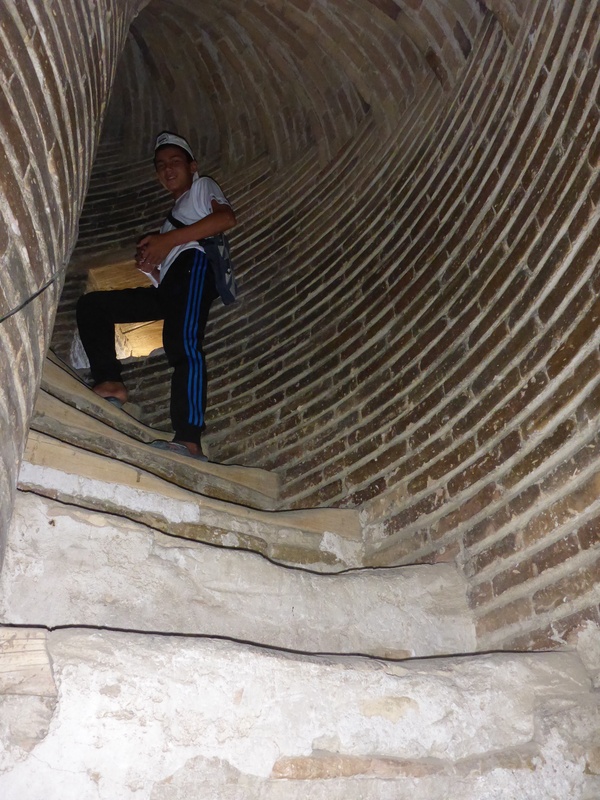 Bukhara is compact enough to walk from one monument to another. 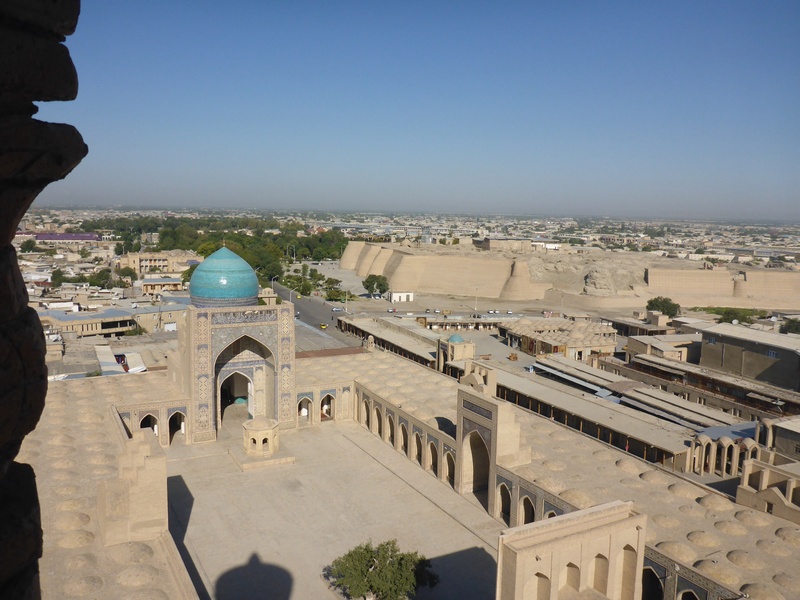 Unesco has done such a wonderful job of restoring Bukhara!! I am afraid that because we are so late in posting this, I will not include any history here as it is easily found and our internet access is limited. 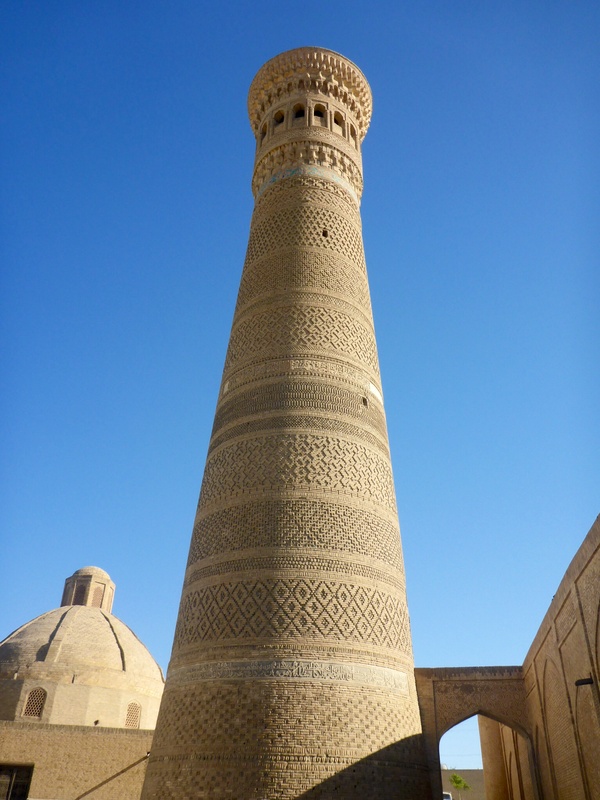 Poi-Kalon minaret, Bukhara, Uzbekistan – 47m high, it was built in 1127, over deep foundations of reeds to withstand earthquakes and has never required structural repairs. 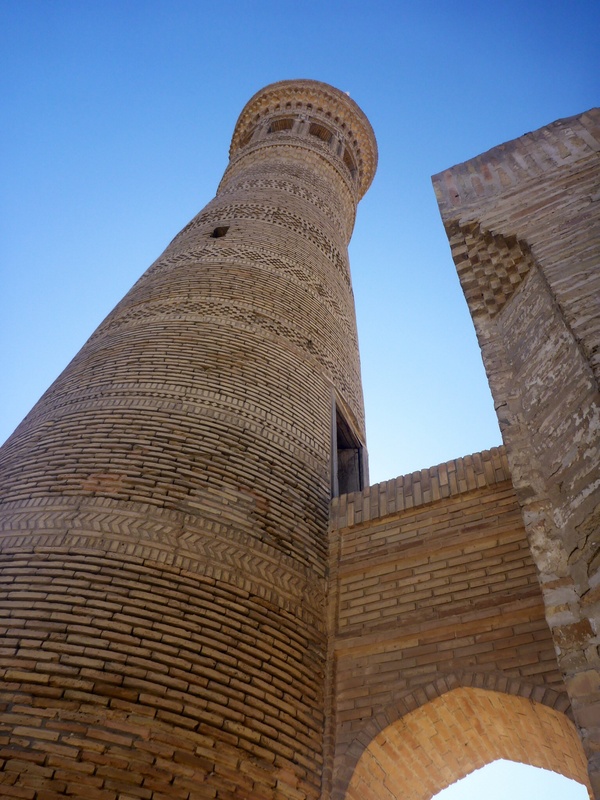 From Bukhara, we headed to Khiva. Phew, that was a long hard hot ride. The only good part was meeting our first fellow traveller, Andy, at one of the few petrol stations. Considering we only found one petrol station between Tashkent and Samarkand (260 kms), 17kms out of Samarkand, we knew getting to Khiva, which was 450 kms away, with the petrol we had, would be tricky. Even getting a place which would accept to fill our 2 containers was difficult!! The road to Khiva was pretty poor so the concentration was intense – we arrived on the outskirts of Khiva after 8 hours. The final part of the ride was the hardest for me: weaving in and out of twisty narrow potholed dead end lanes for about 45′ completely finished me. I got another pouring of water all over me by Anthony to cool me down. We eventually found our hotel. 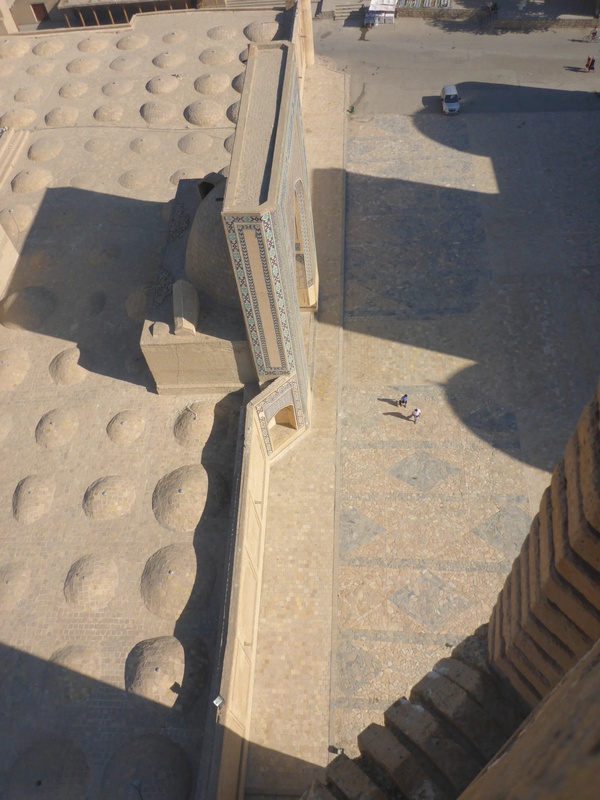 A cold drink, cool shower and change and I was good to set off to discover Khiva in the perfect late afternoon glow. Walking through Khiva was like stepping back in time, just as it was when it was founded in the 5th century and built over 600 years. The street vendors were still there, just as they always had been, selling goods mostly intended for locals. The most surprising goods were fur hats!?!?! 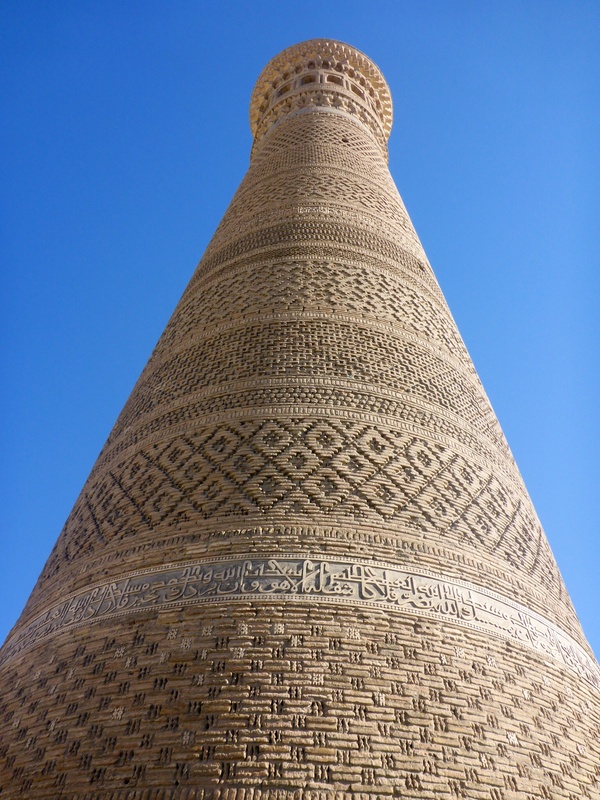 But after leaving Khiva, we saw people walking with those hats, despite the intense searing heat. Good protection against sun burns. Unfortunately, it is now 01.30am and the internet won’t allow me to upload the Khiva photos, so this will happen in a separate post. 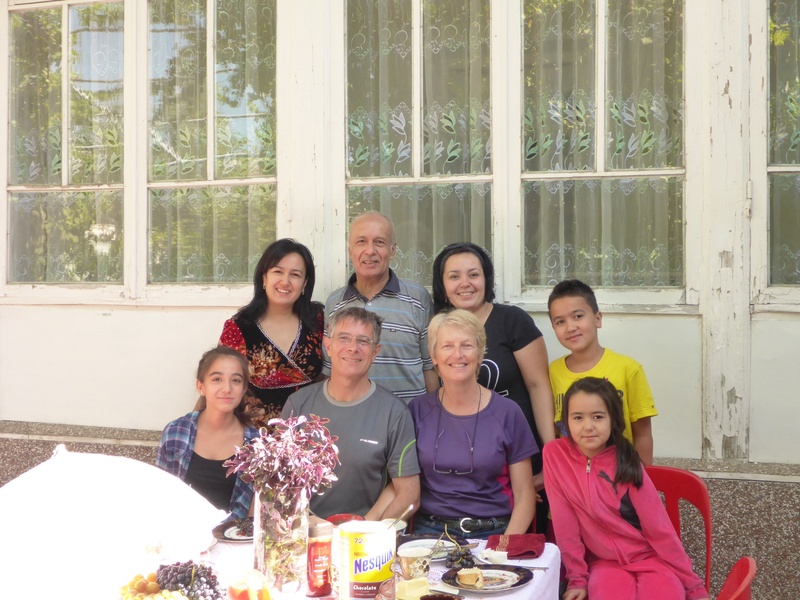 But all is good with the 2slowspeeds, now in Iran – we have been treated to wonderful Iranian hospitality for the past couple of days. Suite au prochain numéro!! So grateful to know all is still well, in spite of intense heat, intense concentration avoiding potholes, sadness at leaving new friends but bubbling over with friendships made and the feast of beautiful architecture. Good to hear all is still going so well. As I’ve said before you both seem to have a natural ability to find people who take pride in showing you their country and its hospitality. Having read all your transcripts I don’t understand how wars start. Good to hear the bikes are also enjoying the runs and behaving impeccably. May i suggest that as part of the daily ritual Anthony throws water over Anne (for good luck !). When do you get to meet Ghengis Khan? Your bikes seem to be leading a charmed mechanical life – I walked part of the Pennine way the other day with an aunt whose nephew and his father had finished their motorcycle trip across Russia in the back of a van with several bags of bits – but they probably didn’t have Beamers! Please keepup the very interesting log. We’ve enjoyed travelling Ghengis Khan’s silk road but glad we’ve never come across any of his followers. I hope the bag of bits wasn’t the result of an accident. Glad you’re enjoying the blog. Enjoy your upcoming trip! !